This review is about item#35245131. This review is about item#35245147. I used it as a truck and a wheel of a machine tool. There is no particular improvement. I'd like to replace it with a new wheel, quiet and move smoothly, I will use it carefully. It is for trucks of product transportation at the manufacturing site. I purchased it and changed it when the wheel of the dolly went bad. Since it will arrive soon, even if it breaks down, it can be repaired soon. We exchanged with wear of the surrounding rubber. It is a type with a bearing. When we needed a lot for repairing the dolly, we used most of the frame part We only need replacing the wheels, repair costs also cheaper and the customers willingly willing Thank you, Mr. Monotaro. This review is about item#35245174. The price is suppressed comparable to other manufacturers and it is perfect. This review is about item#38651925. It is much easier than buying it at a home center. Moreover, since the coupon bought using it, it is delicious delicious with a weak guarantee. I am satisfied more than I thought. Also we will purchase. This review is about item#35245165. I am very satisfied. I do not have anything particular, but I want to keep an eye on durability in the future. We used cardboard and rubber wheels as rubber driven rollers. The frictional force is also many and the feed roller is using it without any problem. Because there are over 1000 transporting trucks in the factory, we exchange defective wheels each time, but it is saved because the price is cheap and durability is no problem. A little smell of rubber comes. Since it is used outdoors, there is no problem at all. The price is also cheap and good. I think that it would be nice if there is a kind of thickness of the rubber part of the wheel. This review is about item#35245156. The sliding of the bearing was good and it was extremely light and I was satisfied. It is regrettable that it is a bit heavy. 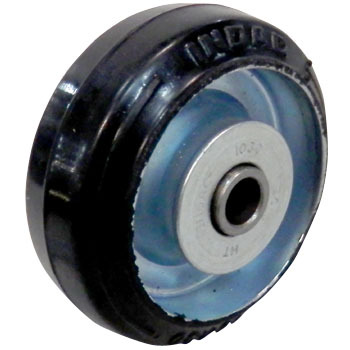 When I was looking for a wheel with a large diameter, I had the size of just the size, so when changing the tire of a car with a pair of hands, put a long bolt in the part of the axle and turn it, it seems to be fine. It is repeat purchase. I am satisfied with cheap and goods. I hope there is a thin shaft diameter. When rolling the trailer, the sound is quiet, the movement is smooth and it is easy to move.